Were you sad and despondent that you didn’t get a chance to buy a Ford GT? I know some people were. Well, cheer up! Because you don’t have to wait for everyone’s Don’t Sell Your Ford GT For Two Years contract to expire anymore: There’s one headed for auction later this month. This lovely blue (!) 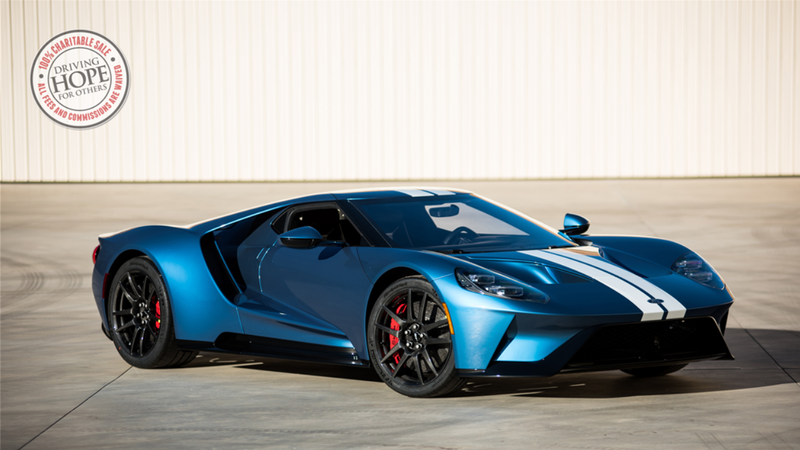 striped Ford GT will hit the block at Barrett-Jackson’s 2018 Scottsdale auction, taking place between Jan. 13 to 21. It was donated for charity for the Evernham Family-Racing for a Reason Foundation. The Evernham Family-Racing for a Reason Foundation will sell the supercar during the auction to benefit the Autism Society of North Carolina’s IGNITE program, which offers activities, skills training and educational workshops that address the social, financial, educational and employment needs of young adults with high-functioning autism or Asperger’s Syndrome. The listing also notes that 100 percent of the proceeds go towards the program. There is no reserve on the GT. So, if you missed out on your first shot at being approved by Ford to buy a GT, this way seems much easier. You just have to outbid everyone else. No application necessary.